Autonomous truck technology has the potential to intensely impact nearly all aspects of the trucking industry. A fully autonomous truck have the capability to detect, interact with and safely react to all characteristics of the driving environment without a driver in manual control of the wheel, this includes but is not restricted to climate conditions, road types and unpredicted events such as work zones and traffic accidents. It may be decades, however, before such a vehicle is commercially available. Autonomous truck (AT) technology is evolving rapidly, and as these technological advancements enter the marketplace, the tasks of truck drivers could dramatically shift. However, some levels of automation are now available for trucks such as automated breaking systems, and such advancements will propel the growth of autonomous vehicle technology over the forecast period. Goldstein Research analyst forecast the global autonomous vehicles market to expand at a CAGR of +39% during the forecast period 2016-2024. The autonomous vehicles are anticipated to hit the roads by 2020 only, as most of the autonomous vehicle projects are in testing phase and facing many challenges related to government regulations and preset infrastructure. However, after the successful deployment of self-driving vehicles the automotive industry is likely witness more than 600,000 unit sales of autonomous vehicles. Based on autonomous technology, driver assistance and semi-autonomous trucks are expected to dominate the autonomous/self-driving trucks market across the globe in coming years. Research and development activities by the major automotive manufacturers such as Volvo and Daimler AG to deploy the semi-autonomous trucks by next few years, will significantly boost the self-driving trucks market. Geographically, North America region is anticipated to be the largest market for autonomous vehicles market as deployment of self-driving cars in the U.S. will begin with several thousand autonomous vehicles in 2020, which is expected to grow nearly 4.5 million vehicles by 2035. Moreover, developed infrastructure and presence of major players is expected to be major growth drivers for the autonomous trucks market. North America is likely to closely follow by Western Europe with a little more than 3 million autonomous vehicles expected to be sold in 2035. 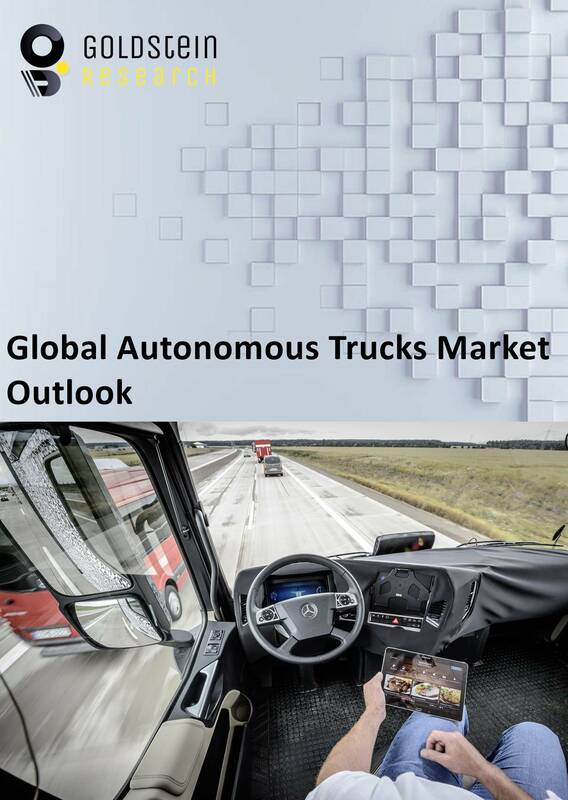 According to our global autonomous trucks market study on the basis of extensive primary and secondary research, one major trend in the market is development of foundational technologies and significant R&D announcements and collaboration projects. Many automotive OEMs and technology companies are in race to develop self-driving vehicles and the services for trucking industry that could expand exponentially with technology. For instance, truck manufacturer PACCAR is working to keep up with the innovation in the space, partnering with Nvidia to develop a self-driving platform for its Peterbilt, Kenworth, and DAF rigs. According to the report, major driver in global autonomous trucks market is rapidly growing investments and R&D activities by automotive companies and favorable government policies for faster development and deployment of autonomous vehicles. For instance, the new legislation in Germany allows the German automobile manufacturers to test their prototype autonomous vehicles on roads. Further, the report states that one challenge in global autonomous trucks market is data security and privacy concerns. One of the major challenges among manufacturers and users is the data privacy and security breach as the autonomous vehicle is a subject that cannot be looked at without concerning the problem of data protection. The report covers the present ground scenario and the future growth prospects of the autonomous trucks market for 2016-2024. The first objective is to offer background on the current state of autonomous vehicle (AV) technologies. The second and more central goal of the report is to outline the impacts of autonomous trucks deployment in coming years. The report also explores market players’ activity and the role of each top industry issue across several levels of truck automation, offering a discussion of impacts to drivers and operations in general. Autonomous Trucks Market Outlook Report has been prepared based on an in-depth market analysis from industry experts. The report covers the competitive landscape and current position of major players in the global autonomous trucks market. The report also includes porter’s five force model, SWOT analysis, company profiling, business strategies of market players and their business models. Global autonomous trucks market report also recognizes value chain analysis to understand the cost differentiation to provide competitive advantage to the existing and new entry players. Our global autonomous Trucks market report comprises of the following companies as the key players in the global autonomous Trucks market: AB Volvo, Robert Bosch GmbH, Delphi Automotive PLC, Google Inc, Uber Technologies Inc., Tesla Inc., Volkswagen AG, Daimler AG, Einride, Embark and PACCAR Inc.